Released by Combat records in 1984. 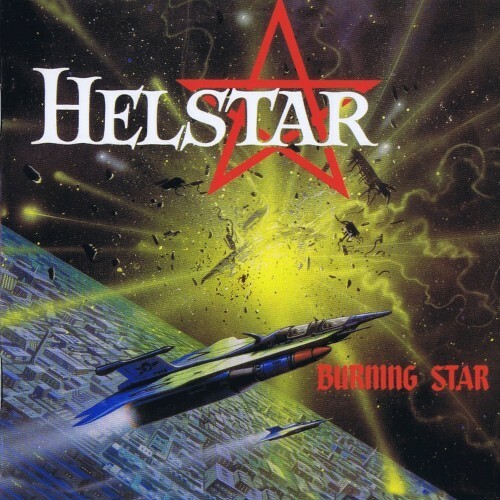 Burning Star is the debut studio album from US Power/thrash metal band Helstar. Helstar is one of the few artists I can think of who's every single album is a masterpiece, and of course Burning Star was the album that started it all. This was the first album I had heard from the band, as well as perhaps the first metal album I owned myself. I grew up listening to classic hard rock, heavy metal, and thrash, but after Aerosmith and Rush really got me into music I had found Helstar at random. It was the greatest random find possible. The music here is a mix of US power metal, classic heavy metal, speed metal, and a bit of proto-thrash metal. Already on their debut, Helstar had their own pretty unique sound with a wide range of metal styles. While you can hear influence from bands such as Iron Maiden, Mercyful Fate, Judas Priest, and Rush (The Rush influence is especially heard in the beginning of "Run With the Pack"), the band manages to muster up their own distinct sound. The guitar riffs are razor-sharp, the drums are powerful, and James Rivera's vocals are absolutely killer. Just listen to his vocal performance on "Toward the Unknown", and that song is one of many reasons why he's among my favorite vocalists. The title track is one of the best album openers, with a catchy as hell descending riff that really makes it sound like you're in the sky and going down in fire. Now you want to hear one of the best guitar solos ever made? Just check out the end of the solo, it sounds like a downward spiral into the abyss. "Witch's Eye" is another highlight, and the punchy main riff just kicks the listener in the gut. Rivera's vocals switch perfectly between a sneering bite to high pitched screams on both of these tracks. Already on the debut with the song "Dracula's Castle", there is lyricism based around vampires, which would return as the concept album "Nosferatu". The rest of the lyrics follow your usual 80's metal lyricism of darkness, fantasy, etc. The title track, with it's menacing shredding, is reflected incredibly well with the sci-fi cover art. It really makes you feel like your flying through the stars, involved in a chaotic space battle. This album holds a special place in my heart as not only an amazing album but also as the first metal album I ever owned myself and listened to a lot. I hadn't of listened to it in a while, but coming back to it I'm glad I still hear the magic. A classic, as well as one of my favorite albums of all time. Do yourself a favor and check this album and this band out. No HELSTAR BURNING STAR reviews posted by members yet.